I was glad to get out of Helena and get back on the road. The hotel was okay, but I think that maybe the staff all graduated from the Stepford Wife School of Hotel Management. Helena has the worst curb cuts in the U.S. The only time I've bottomed out in the EVC on the whole trip, was going in and out of the hotel and laundromat in Helena. And the traffic was making me crazed; I'm going to go nuts when I get back to the real world of congestion. The scenery changed again and again between Helena and Glacier. First I drove through narrow can yons, then it opened up and was hilly. And then there were Lunarscapes out in the middle of nowhere. The hilly part was my favorite. This is Blackfeet territory: bordering the Rockies from here north into Canada and south to the three forks of the Missouri River and on to the Yellowstone River. Some of the Blackfeet believed that the first buffalo came out of a hole in the ground. When the impossible happened, and the buffalo were decimated, they claimed that the whites found the spot, hazed the herds back into it, and then plugged the holes. For part of the drive I followed the Lewis and Clark Trail, and I passed the only point on their entire journey where they had a hostile Indian encounter. And that was a case of mistaken identity; they were messing with Blackfeet when they thought they were messing with Gros Ventres. I learned that the Indian Trading Posts were licensed by the government. I never knew that. I went from cattle land to sheep land and back again. Lots of cattle. Are there brave and/or defiant cows who tiptoe gingerly over cattle guards? I passed over lots of creeks: Prickly Pear and Wolf, Dry Creek, Spring Creek, Flat Creek. And I drove over some canals: the Flowaree and the U.S.R.S. I have no idea what that U.S.R.S. stands for. I also crossed the Sun River a few times. 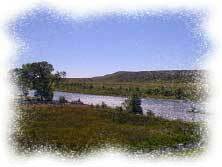 The Sun River was known to the Indians as The Medicine River. It has been diverted into a dammed (and damned) storage reservoir. I could only wonder what it all looked like a hundred years ago; not much else besides the natural water flow has probably changed. The fields here are full of rocks. I can't imagine how they grow crops, but they do. But it is very very beautiful. And I kept imagining that I was seeing Indians on horseback lined up on the bluffs. Obviously I watched too much T.V. as a kid. I talked to some older people from Florida when I stopped for gas in the town of Choteau. They were driving an ENORMOUS motorhome, and had been traveling since May. They wereon their way home. In Browning I stopped and went through the Indian Museum. It was excellent! Great exhibits and a great gift shop and gallery. Glacier was a Yellowstone kind of nightmare. First I drove into East Glacier. The lodge there is old and neat. There was horrendous traffic. (Which sent me into a tailspin.) 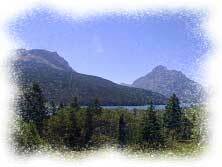 Then I drove to Two Medicine Lake, which is about 15 miles down another road. The campground at Two Medicine was really full, and most of the sites were right on top of each other. It felt incredibly claustrophobic after the places I've been camping. I passed. I drove around and looked at the lake and took a little walk, then took off in the car again. I stopped at a beautiful campground at the other end of the lake that is owned and operated by Indians, but the roads were so horrid that you couldn't get back to the campsites and there was trash everywhere. I drove around in there, hoping to get back to a site right on the lake, but no luck. I gave up and drove some more. It was getting dark, so I stopped at a Good Sam field kind of park on U.S. 2 about halfway to West Glacier. I set up the tent, emptied the car, plugged in, and made my bed. Then I ate rice cakes and almond butter and a banana, and watched Lone Star, which I had found a few days ago in the bottom of a storage bin. I enjoyed it.